Summer is a fun time of year for humans and dogs alike. Many dogs love to play outdoors despite the heat. ​Summer safety is no joke, and it's up to you to make sure your dog stays cool and comfortable. ​Fortunately, there are a number of steps you can take to keep your dog safe on the hottest days of the year. People can take their ability to adapt to hot weather for granted and forget that their dog does not have the same natural cooling capability. Dogs cannot cool themselves by sweating like humans. They might sweat a small amount through the pads of their feet, but the main way a dog cools off is by panting. Unfortunately, panting is not enough when it is extremely hot and humid. While you may not find that the temperature's too hot to be outside, your dog may be miserable or simply going along to please you. On really hot days, it's best to keep your dog at home in the air conditioning. Heat stroke or exhaustion and injury can occur in dogs faster than you may think and your dog's safety should be your top priority. 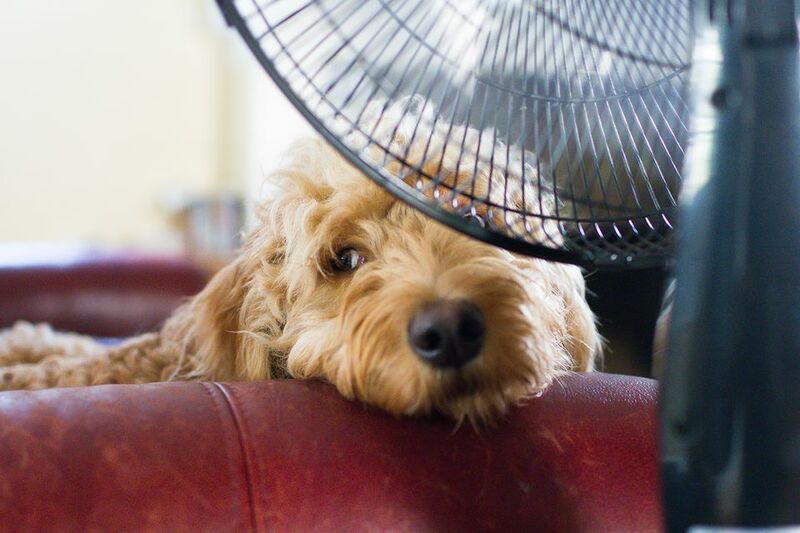 If your home is not air-conditioned, you will need to take appropriate steps to keep your pooch cool while you're away. It is essential that you keep fresh, cool water available to your dog at all times. In hot weather, this is even more crucial. Make sure you keep the water dish in a shady location and change the water frequently. To constantly keep fresh water available outdoors, consider installing a watering system that hooks up to a faucet. These are designed to provide water as needed and are usually triggered by motion or a specific action. If you go to the park or somewhere else with your dog, take along as much water for it as you do for yourself so you both stay hydrated. In addition to water, you can try feeding your dog some delicious homemade chilled treats. Your dog might enjoy a little sunbathing, but it ultimately needs a cool, shady spot to relax. Prolonged sun exposure not only leads to heat exhaustion, but it can also cause sunburn. Yes, dogs can get sunburned too. While sunscreen is available for dogs, it is not ideal. The best thing is to offer shelter. Shade from trees is nice, but it's not perfect either. An actual structure is better. Consider getting an insulated dog house, but make sure it is large and well-ventilated. Alternatively, you might put up an open-air tent or canopy. The addition of a fan will help cool things down further. If possible, put the shelter in a shady area to keep it extra-cool. Of course, the ideal shelter is your home. If possible, install a doggie door to allow indoor access. If your dog loves water, then a large tub or kiddie pool (molded plastic, not inflatable so nails can't pop it) might be a great addition to your yard. You can find inexpensive tubs or pools at most home stores. Many dogs enjoy playing and lounging in the cool water. Just make sure you supervise your dog at all times. Keep the pool in a shady spot and change the water frequently. Do not leave the pool full when not in use, as it may attract mosquitos. Instead of a pool, you might also try running a sprinkler to see if your dog likes it. However, most dogs prefer a pool to a sprinkler. Your dog's need for a cool, shady place to relax extends into the house. While a dog bed is nice and soft, it might also be too warm. That is why many people notice that their dogs prefer to lie on tile or concrete floors when it's hot out. A cooling dog bed can offer the comfort and softness of a typical dog bed with the coolness your dog craves. These beds often use a gel-like material or water to keep the temperature nice and cool. They are especially great for senior dogs as an alternative to hard floors. There are several other products designed to cool off your dog. Some work better than others, and often it just depends on the dog. If you decide to try one out, just remember that nothing can substitute fresh water and shade. No dog should go for long without plenty of both. One common mistake people make is taking their dog on a walk in the heat. Pavement gets very hot under the summer sun and can easily burn the pads of your dog's feet. If it's too hot for you to walk on barefoot, it's far too hot for your dog. Take your summertime walks in a grassy park or, in the least, direct your dog to walk on the grass next to the sidewalk. Cooler air is the best way to prevent and relieve overheating in your dog. No matter how you try to keep your dog cool, the best thing you can do is to keep a close eye on it. When in doubt, get the dog to a cooler area. Be sure to contact your vet immediately if you notice signs of heat stroke. If you suspect your pet is sick, call your vet immediately. For health-related questions, always consult your veterinarian, as they have examined your pet, know the pet's health history, and can make the best recommendations for your pet.